MARJI MARINE is involved in maintenance and repair of fast inflatable speedboats and fiberglass-made boats. Investing in plant creation and equipment acquisition have created in Igoumenitsa,Thesprotia a modern and high standard technical support unit for vessels. 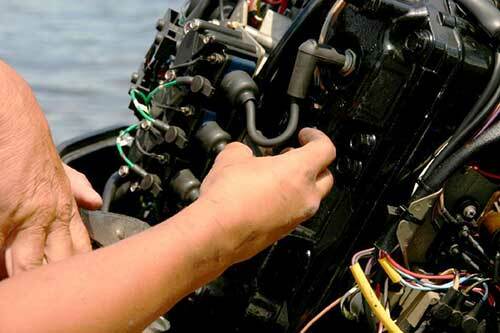 Boat engine maintenance is among the most important issue of concern to the owner of a inflatable or polyester-made vessel. Engines must always be in perfect condition. The owner of a vessel should always be sure that the engine , as the only means of propulsion of the vessel will always work and will not leave him in the middle of a trip. And That is our goal. Our company offers full service of sea-based engines with the most modern and sophisticated tools. We are an authorized sea-based engine service center. Our company uses OEM parts and lubricants from all available manufacturers. Let us treat your vessel to our special trained personnel, for you to be safe anywhere at sea.